Many of you already know all the wonderful benefits of NUTS. They are the perfect snack, filled with nutrients (including B-vitamins, zinc, magnesium and vitamin E, with the nutritional profile differing slightly depending on the nut), healthy fats, fiber and protein. They fill you up and nourish you. And they’re so yummy and versatile – great for adding a crunch to recipes, to make pestos, creamy sauces, and more. However, many people mistakenly put peanuts under the same category as tree nuts - when actually, peanuts are NOT tree nuts, they are LEGUMES. While they do carry some of the above benefits of tree nuts, they also have many qualities that personally keep me away from peanuts. 1) ALLERGENIC quality. Peanuts have a high likelihood of provoking food allergies or sensitivities. Diagnoses of peanut allergies in children has risen significantly in the past years. But even if you don’t have an allergy, adults can still develop a sensitivity to peanuts after repeated consumption. 2) They are MOLD forming. Peanuts contain Aflatoxin, a byproduct of mold that you want to avoid. Alfatoxins are common in foods that are stored in bulk in hot and humid conditions, as is the case with peanuts, and have been linked to liver cancer and stunted growth in children! Also, peanuts’ nutritional benefits are lower than that of most tree nuts, such as Almonds, Walnuts, Pistachios, Cashews and Macadamia Nuts. Plus, peanuts are most often sold with added oils, salt, and other ingredients. Same goes for peanut butter. So I definitely suggest that you begin the switch – for you and your kids – to other nuts! 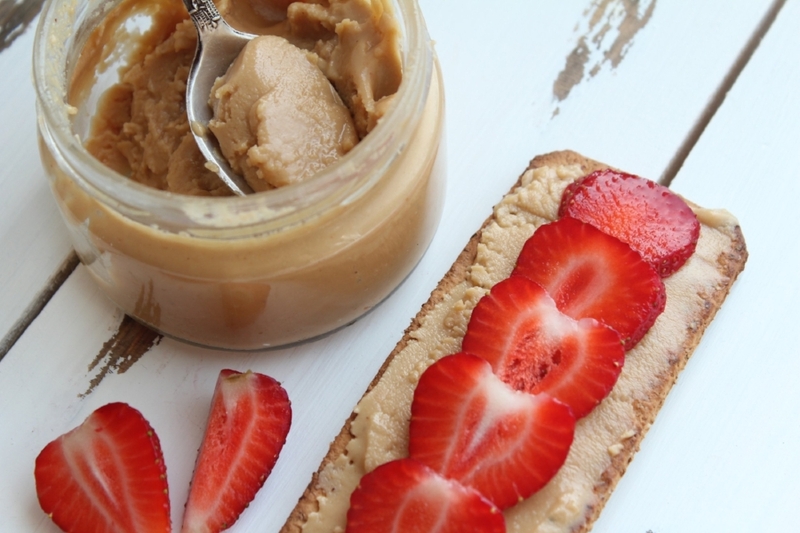 If you’re traditionally a Peanut Butter lover, TRY THESE TWO NUT BUTTER RECIPES that are peanut-free and delicious! Place all ingredients (cashew butter to honey) in a food processor and blend until smooth. Taste and adjust as needed to get your sweetness / consistency. Serve with sliced fruit of your choice, or raw crudites as celery/carrots, or spread over a slice of healthy, whole-grain or gluten-free bread. Place all ingredients (almond butter to honey) in a food processor and blend until smooth. Taste and adjust as needed to get your sweetness / consistency. Serve with berries or fruit of your choice and/or as a topping for your chia pudding or smoothie bowl.